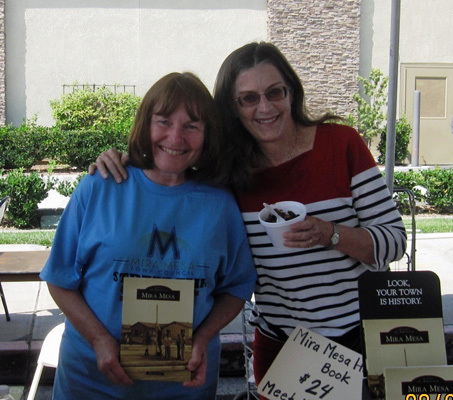 1992 Volunteer of the Year Sharon McCollum (right) with 1990 Volunteer of the Year Pam Stevens at the 2013 Mira Mesa Street Fair. Sharon and Mac McCollum moved to Mira Mesa in 1975 with a one year old daughter followed by twin daughters shortly thereafter. She worked in evenings at Hewlett-Packard (HP) so she could be home during the days to raise her daughters and to start volunteering daily! She slowly started to get involved with their HOA pool/park as they lived next door and started to question procedures/results, and has now been actively involved in the HOA for 40 years. She currently spends about 80-90 hours/month with the HOA to help the people in the 349 homes. After almost 40 years, she now holds the title of “Associate Consultant/Coordinator/Historian/Keys”. Once her daughters started kindergarten at Ericson, she was involved in the classrooms and PTA all the way through middle school at Challenger & Wangenheim and Mira Mesa High School (frequently historian/publicity- writing articles for Sentinel, fund raisers, etc). She always found herself involved in any other school activity or school improvements. One example was the months of letters/photos getting the city to fix the street drain that backed up with sludge across Westonhill in front of Ericson where the kids crossed. That is just one of many projects that she took on for Ericson, Challenger, Wangenheim, & MMHS. She was also involved in many meetings as the new Scripps Ranch High School was being built. Sharon has also been involved with Girl Scouts, a bladder cancer support group, and an HP retiree hiking group. Since 2008 she has worked for Horizon Hospice, which was recently acquired by Scripps Hospital. She continues to work for the Hospice every Tues in the Poway office. Sharon McCollum and Jeff Stevens were jointly honored as Mira Mesa Volunteers of the Year for 1992.